Ok so todays card is another Sweet Shop tryout for the DT. This is the last card that i sent to them for their design team call. This is Big Girl Pants from Mo’s Digital Pencil. The reason I used these cute images instead of the ones from the sweet Shop is that I just found them and wouldn’t have time to get their stamps. They have some great sets that I hope to order soon. When I seen this image I Knew exactly what I was going to do with it. I had to make the sentiment myself because I couldn’t find a digital stamp and I didn’t have one on hand. So I typed it up and die cut it with the same as the brown cut piece just turned it the other way. I’m so happy with this card. My stamp finally arrived for the back of my cards today. 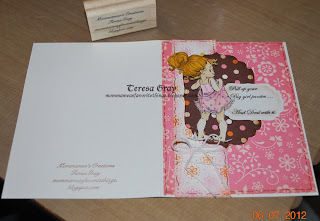 This card was the first stamping of this stamp. 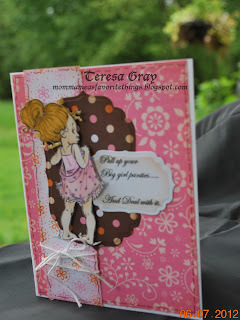 I have decided to name my card making as Mommamea’s Creations. Went well with my blog. So now all my cards will have this stamped on the back of them. The papers I used are retired from Stampin’ Up I really like this package. It had so many fun papers in it. Well I think this is my last design team try out for now. If I get picked it will be wonderful if not it wasn’t in God’s plans for now. He knows what is best. i just thank them for giving me a chance and taking the time to look at what I do. May you all have a blessed day and thank you for stopping by. It was a pleasure to visit with you today. I'm already a follower from The Outlawz. Just wanted to say good luck with the DT call. Your card is fabulous! 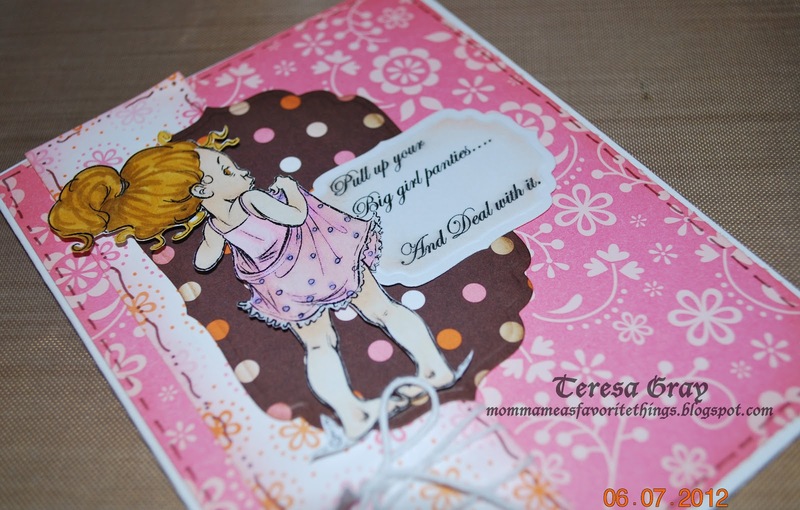 Love the image and the paper you used. Thank you. When I seen this Mo images I knew what I was going to create. Love when that happens. Thank you for following my blog. I am following yours too. Had to redo it. Don't know why. Thanks for the comment too.